Posted on June 28, 2008 at 12:07 pm in Hindi movies, Subtitle delight	| RSS feed You can skip to the end and leave a reply. & I come from a Family who has been connected to Hindi films right from their early days. My late father Pandit Narendra Sharma gave many immortal songs to Hindi films. Hi Lavanya, Your father wrote the lyrics for one of my favorite Suraiya songs “Naina Deewana” from Afsar :-) I see that he also wrote the beautiful bhajan “Yashomati” for SSS, which is my favorite song from that film. He must have had some amazing stories to tell!!! Wow. Thank you for coming by here! I’m sad that I don’t read Hindi so your blog is somewhat inaccessible to me. Sigh. You know, I’m beginning to think I should watch Hindi films with subtitles. The entertainment would double, I’m sure! Actually, subtitles across quite a bit of the world can be hilarious: I remember watching a Malaysian version of Spiderman, in which our hero battles the Green Goblet in the climax of the movie. I could do that…and I don’t know if I’d put up much of a fight. I started writing in English then ventured into HINDI Blog writing. Yes, you are correct re: the Suraiyyaji song Naina Diwane & Yashomati Maiyyase sung by Lataji . I have plenty of stories which I have shared on my BLOG. I see you mention Melinda your Sareewali friend. I get up dates from her & would love to buy some from her — if you can send her my E mail information that is ..I’d appreciate ..
Peace , time out ..
My most favorite of all masala movies. And always a delight to see the Shashinator making an appearance on the Memsaab pics. Whee! ajnabi—listening stealthily is especially difficult if you are listening to stealthily people. lavanya—Melinda’s sarees are wonderful, she knows more about regional handlooms than anyone else I know. Love it. It’s a good idea to watch the films with subtitles I think, what a joy! 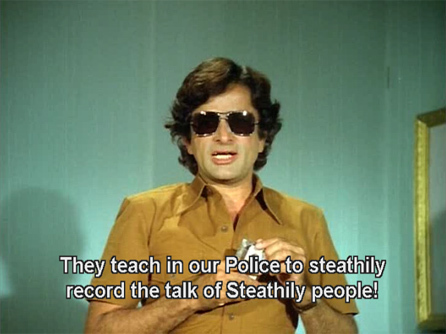 Shashi, drool, drool. You are particularly lucky if you don’t NEED them, so when they disappear or go astray you can still follow the plot :-) They do sometimes really enhance the whole experience though. Suhaag, the best lost and found brother story, since Coolie, I think i might become a police officer just like the Shash! he makes blind policemen look good! I’ve never been good ad diagramming sentences, and the notion of “Stealthily people” – with a capital S, even – has shrunk whatever abilities I had. Then again, English is a delightfully dynamic language, constantly changing to reflect its speakers, their contexts, etc., so who am I to question the words given to a character from days of yore – especially when that character is played by Shashi! The Shash, of course, need not justify Stealthily or Statically. Ever. Maybe Stealthily people is a dangerous criminal group, who knows. I have the WEG version; I’m not sure if it’s available any more (Eros has released it too). You see, I got the Eros version, which has decent subtitles and even subtitles for the songs (I was most positively surprised). I know decent subtitles are a good thing, but I like strange subtitles. At least I know what to look for now. Thanks. I come back to this whenever I want a good laugh. Can’t get over the ‘start. walking statically’. I do so love strange subs. 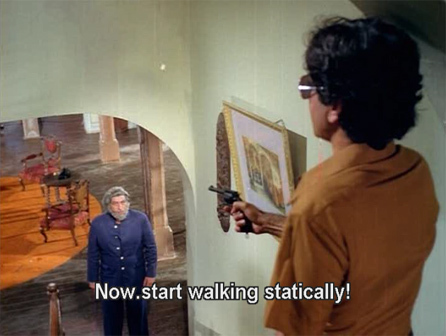 Another feature of the Suhaag subtitle madness was the way periods appeared randomly in the middle of sentences. Hilarious!